More details to come, but here's a list of some of the shows I have helped create or have appeared on. I supplied numerous publicity photos from Hayley's Disney films and assisted in fact checking. This may have been my first screen credit. 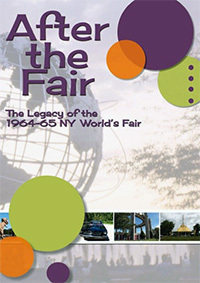 The 1964-65 New York World's Fair comes back to life in this documentary that combines archival footage, along with interviews with those who created key attractions at the fair. Discover little-known fair connections to some of the best known names in entertainment. See how Walt Disney used the fair to prepare the east coast for his brand of themed entertainment. 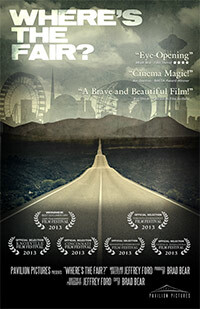 Then learn how the legacy of the fair lives on all around us today in our technology, pop culture, and ideology. Hear from Iron Man director Jon Favreau, Men in Black director Barry Sonnenfeld, and Disney legends Bob Gurr and Rolly Crump on the wide-ranging influence of the fair. Its a light-hearted journey for the whole family through the history, and present-day impact of the 1964-65 New York World's Fair! I am one of the people interviewed in the film. I also supplied many of the photos. This special ran on Turner Classic Movies several times in December, 2008. I was interviewed about Disney's early live-action films and television series. It was great to be associated with some of the celebrities and crew who worked on so many of these memorable films. I appeared in the episode "Worlds of Amusement" and discussed early roller coasters, Coney Island, theme parks, Disneyland, and world's fairs. I also supplied pictures and film footage. The episode first aired on October 6, 2015. I supplied pictures of the Hertz "Corvette" strollers used at the 1964-1965 New York World's Fair. A rare "Escorter" from the 1964 World s Fair scoots into the shop for a restoration. Will Rick and the crew give this vintage vehicle a restoration that out of this world or will it be a world-class flop? 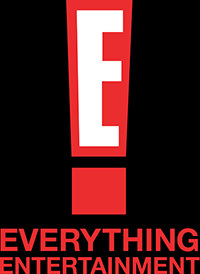 I was interviewed by the E! cable network for their program airing the week of July 24, 1998. They wanted to salute Guy William's work as part of a look at the new Mask of Zorro film, and The Disney Channel was kind enough to suggest they interview me. There are some Zorro clips and history, a look at my Zorro website and scenes of yours truly. This show evidently only aired overseas and I don't have a copy, so I'm not sure how much I'm in it. I was interviewed about Disney's canine stars from television and films. If anyone has a copy please let me know! 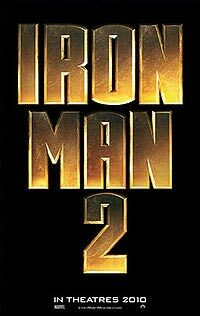 My love of world's fairs paid off in an unexpected way when I was asked to consult on the film Iron Man 2. Part of the action revolves around a clue that was possibly hidden at "Stark Expo 74", a fictitious fair that bears an amazing resemblance to the 1964-1965 New York World's Fair, and at a newer fair. I contributed the photographs used to create these fictitious fairs, suggestions on how some of the attractions might have looked, and what items you might have found in a fair designer's studio. Filmmaker Matthew Silva created a wonderful look at the New York State Pavilion from the 1964-65 New York World's Fair, tracing it from the glory days of the Fair through it's current status as an empty ruin. His film has helped raise public awareness of the pavilion, which is currently (2015) being painted for the first time in decades. I supplied pictures of the pavilion and was one of the people interviewed in the film. On May 22, 2015 I was part of a panel at the world premiere of the film in New York. I was interviewed for A Fairy's Tale, a documentary on the creation of Tinker Bell and how she was used on the television series. Don't blink or you might miss me, but I'm there. From the Cutting Room Floor to Your Living Room! During the production of Star Trek: The Original Series, bits and pieces of footage were left on the cutting room floor, then stored away in film cans for decades by the Gene Roddenberry Estate. 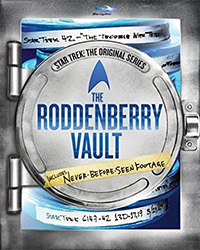 Now, in celebration of the show’s 50th Anniversary, The Roddenberry Vault has finally been opened. Along with 12 of their favorite episodes, fans can see and own behind-the-scenes footage from the making of the series as well as alternate takes, deleted scenes, omitted dialogue, outtakes, and original visual FX elements. I've been a Star Trek fan ever since it was first aired, and was lucky to meet a number of the cast and crew as I interviewed them for articles in Starlog magazine or at various events. Over the years I've collected the books, the tapes, the DVDs, the Blu-Rays, etc. - just like any good fan would. Thus, it was a special thrill to see my name on a Star Trek project. I supplied several world's fair images for a section on influences on Star Trek designs. 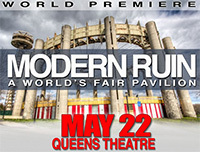 The film starts at the 1964-1965 New York World's Fair. I supplied the reference photos used to recreate the Fair, and consulted on a variety of items such as costume design, prop pieces, vehicles, etc. My work on the film was mentioned in the New York Times and at the D23 event in November, 2014. 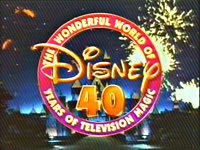 When the Disney Channel was launched in 1983 the programming was a mix of new shows and oldies but goodies pulled from the film vaults, making it a wonderful thing indeed for Disney fans. Since most of these older shows had never been released on home video it was a rare opportunity to catch up with some old friends. As time went on, though, there was less and less of this vintage stuff, and more and more dumb teenage sitcoms. Finally, the old shows were relegated to airing late at night and early in the morning, on a segment titled "Vault Disney." I was brought in by Disney to help sell the concept and then to pick the shows. Not everything could be used (they didn't want to pay for any new video masters, for example) but it was one more chance to get this material seen again, so I was happy to participate. 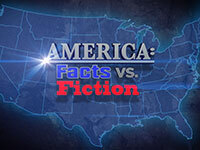 Sadly, in 2002 the segment was dropped, and the old TV shows are sitting unseen once again. This is one of my favorite projects for Disney. 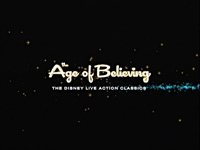 I was thrilled and honored to be part of this documentary about Walt Disney. 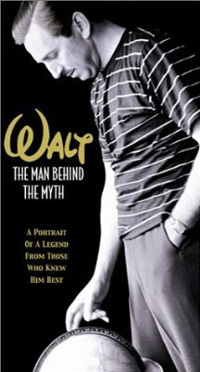 I had first met Diane Disney Miller at Disneyland when I was on a panel about the CD-ROM biography of Walt described here. I was flattered when she told me that she really enjoyed what I said that night about her father. A few years later I was then invited to be part of this project, which was sponsored by the Disney family. I was the main person speaking about Walt's television work. It was daunting talking about Walt with his family there on the stage watching, but I was happy how it all turned out. 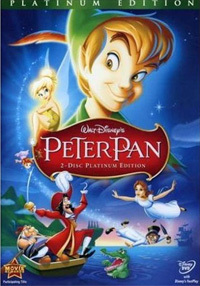 It was the first show to air on ABC following the events of 9/11, and has since been released on DVD and Blu-Ray. 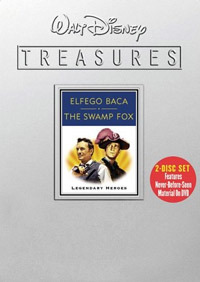 Inspired by true life heroes, these are two of Walt's most exciting television shows, ELFEGO BACA and THE SWAMP FOX. Elfego Baca is a gunfighter (Robert Loggia) in the old west who changes his ways to become sheriff and then a lawyer. Elfego deals with rampaging cowboys, outlaws and more in this exciting series about law and order on the frontier. The Swamp Fox stars Leslie Nielsen (who starred in the classic film "Forbidden Planet," and would later become famous for the "Airplane" and "Naked Gun" movies) as Revolutionary War hero Francis Marion. This patriot fought the British using unusual methods, and became known as "The Swamp Fox." In this superb series, Marion matches wits with the Tories in a story of adventure and action. Bonus materials will include an interview with Robert Loggia, star of "Elfego Baca;" "Tales of Courage and Adventure" a featurette that examines the origins of these historical figures and the fascinating story of their lives, still frame galleries from these TV shows, and more. Introductions by Leonard Maltin. I appeared in Walt Disney Presents Heroes of the American Frontier, a documentary about all of the Disney western heroes. This included the two title stars of the DVD set, along with Davy Crockett and other less well-known efforts. Fans of the series were justifiably upset that Disney didn't release all of the episodes of Elfego Baca or the Swamp Fox. Why they mixed the two of them into one DVD set and just didn't do a complete set of one or the other (or even better, both) is a mystery to me. I loved both of these characters and hope Disney releases the remaining episodes some day soon. THE MICKEY MOUSE CLUB'S magical mix of entertainment was so captivating to television's first generation of children, watching it became a daily ritual. And so the first day of the show's second season, millions thrilled to the debut of a new adventure series, THE HARDY BOYS: THE MYSTERY OF THE APPLEGATE Treasure. All the cliff-hanging suspense unfolds right here, including the entire MICKEY MOUSE CLUB episode that introduced the series. Plus, you'll get clued in to the truth behind the novels' author Franklin W. Dixon, and you'll witness the reunion of Tim Considine (Frank Hardy) and Tommy Kirk (Joe Hardy) at the scene of the crime -- Stage 2 at the Disney Studio. 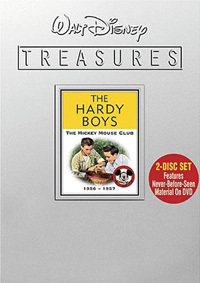 This show about the Hardy Boys serials from the Mickey Mouse Club was released as part of the Disney Treasures set of DVDs. I'm a big fan of the Hardy Boys book and the Mickey Mouse Club serial, so being part of this project was a special treat. I was interviewed about the creation, casting and popularity of the serial, and also did fact checking on all of the Treasures series released that year. 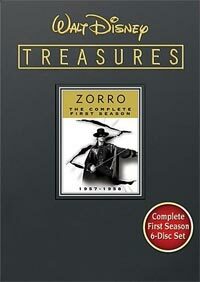 Anyone who knows me will know that I am a big fan of the Disney version of Zorro. When I wrote my book on Disney television that was the first chapter I put together, using it to help sell the rest of the project to the publisher. I had been pushing for a DVD release of the series ever since DVDs first hit the scene. Disney did release a colorized version of the show, and a few episodes on VHS, but I felt that it really should be shown in the original black and white. Happily the powers that be finally agreed. Both seasons are now available, for a total of 78 30-minute episodes, as well as the four one-hour episodes shown on the anthology series. Each season is in a boxed set with other extras. I'm thrilled to be part of a documentary about the series and Guy Williams on the Season One set. I have full details on the DVD sets here. I am one of the people interviewed in the film. 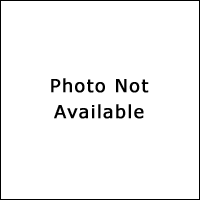 I also supplied a number of photos. This was an interesting project in many ways. I was working on my Disney television book in my spare time, but I was working fulltime at Warner Bros. One Wednesday I got an urgent call from a producer at Disney asking if I could come by for a meeting about a new television project as soon as possible. I met with him the next day, and it turned out that ABC had rejected the studio's initial plans for a show commemorating the upcoming 40th anniversary of the anthology series. They needed a new idea and they needed it immediately. I told him I would give it a shot and would have something for him the next day, a Friday. I quickly did my best to lay out a one-hour program about the series, and after a night of little sleep delivered the results Friday afternoon. On Monday he called and said there was good news and bad news. The bad news was ABC didn't want to do a hour-long show, and I was crushed. The good news was they wanted to do a two-hour show! 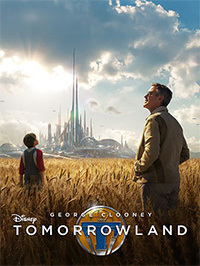 That launched a series of meetings with the outside production company Disney had hired to put the show together. When it was all over there was some resemblance to my original show, and I did get a screen credit, so all-in-all it was a fun project. Just don't ask me how they picked some of the cast. I still can't figure it out.